Whether you’re a new mom or just know one, bringing a newborn home is a stressful time. From setting up a crib to purchasing pacifiers, there is a huge number of things that moms need to do. It’s overwhelming to try to keep track of all of the necessities, let alone make sure that you’re getting top-quality products for your child. As parents, we understand that. As a result, we’ve taken the stress of finding one of the most important items—the baby monitor—off of your hands. Below is our definitive Top 10 list, in no particular order, of the best baby monitors on the market right now based on price, features, and reliability. While not specifically a baby monitor, this high-tech camera works wonderfully as one. The NestCam is a top-of-the-line indoor security camera that was originally created for general use in your home. Click on the image to check the camera out on Amazon. On Amazon, this product has an average of 4 stars derived from over 5,000 different reviews. Generally, reviewers are extremely happy with the easy setup, professional-level quality of the picture, and overall design of both the equipment and the companion app. Many reflected that it’s a great way to check and see what is going “bump” in the night! The thing that most people were unhappy with was the NestAware subscription, which is required to keep any records of the recorded material. Many people complained about the annoying advertisement banner that appears in the app if you choose to forego the service, which feels too obtrusive and is frustrating for customers who have already spent good money on the product. ​To Purchase the NestCam or Learn More about the Product, Visit This Link. The Willcare baby monitor is a great monitor at a low price point. With a number of features and over 200 reviews on Amazon, this monitor is a great option for someone looking at the lower end of the price range but still wanting some amazing features. With 4.3 out of 5 stars and 255 reviews, it seems that this high-quality product is just starting to get noticed by Amazon buyers. 79% of reviewers rated it at 5 stars, overwhelmingly more than any other monitor reviewed. Most were wholly surprised at the sound quality offered by the Willcare, saying that the background noise reduction worked like a charm and the sound sensitivity was unparalleled. Parents also loved the fact that the night light on the baby’s unit could be controlled remotely! The negative reviews that we found seem to stem from faulty devices. As an additional protection though, we recommend buying the extra 3-year protection for just $3 to make sure that your monitor is operating smoothly for a long time. To Learn More about the Willcare DBM-8, Click Here. This product has an average of 4.5 out of 5 stars on Amazon and has been reviewed by over 11,000 people. This is an impressive number and it is largely due to the quality of the device and the customer service provided by Infant Optics. Many reviewers claim that the company was quick to replace any parts that were malfunctioning at no cost to the customer and some seasoned parents even stated that this was the best video monitor they have ever used! The biggest complaint that customers had was the battery life of this piece, stating that it ran out faster than they were expecting. The reason is that video monitors generally drain battery life more quickly than audio monitors and this is something to consider when making your purchase. Made by VTech, one of the best brands in mobile phones and baby care products, this digital audio monitor is a great option for families who don’t feel that they need a video feed for their baby. As a company dedicated to extraordinary consumer electronics, VTech’s baby monitors are some of the best that you can get. This product has an average of 4 stars on Amazon with over 4,000 reviews. Over half of the reviewers gave it 5 stars, citing the clarity of sound and the sensitivity level as the best parts of the monitor. The VTech monitor will remain quiet until it picks up on your baby’s cries, so ambient noise will not be a bother to parents. Negative reviews focused on the lifetime of the product, claiming it was shorter than they expected. To Learn More about the VTech, Visit the Amazon Page Here. Similar to the DM221 but without the two-way transmission or rechargeable batteries, this device is an amazing option for families looking for a simple monitor at a low price. Most reviewers on Amazon are generally happy with their “no-frills” baby monitor, one man even commenting, “We can hear the same baby, same crying, $80 less [than more expensive units].” With an average of 4.1 stars out of 1,680 on Amazon, it’s hard to challenge this simple but powerful device. Negative reviews complained of static noises and short device lifetime, but by being diligent in turning off the monitor when it is not in use, you can probably prolong the battery life. Reviewers also commented that the static noise issues were like caused by low battery life. Additional power cords help the battery life issue and at a reasonable price, this unit can be easily replaced if need-be. To Learn More about the VTech DM111, Click Here. 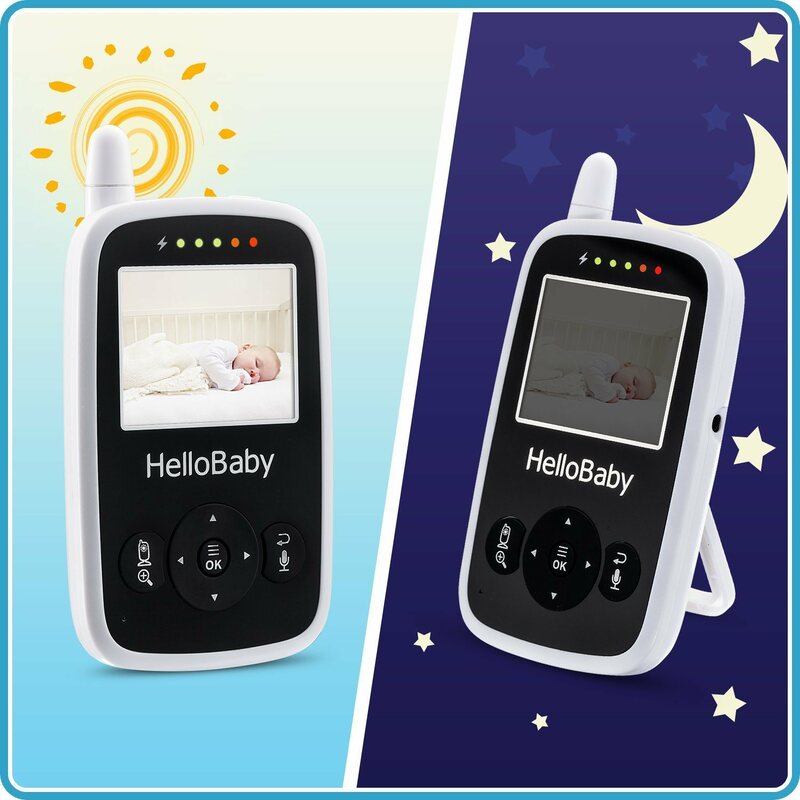 If you are looking for a battery-powered baby monitor that has everything but the kitchen sink, the Hello Baby Wireless Video system is the choice for you! Most reviewers are absolutely in love with their Hello Baby camera. With 1,295 reviews, 50% of customers rated it at 5 stars, giving it an average of 3.8 across the board. The happiest customers were blown away by the quality of the camera and the distance of range (one woman commented that it worked like a charm in her 2,800 square foot home and even extended over to her neighbor’s house!). Negative reviews focused on the short battery life that is inevitable with video-based monitors, but several reviewers who initially gave low scores updated their reviews after being in contact with customer service. Overall, this is a great camera that’s in the middle-of-the-road price range. To Learn More about the Hello Baby, Visit the Amazon Listing Here. Babysense is committed to beautiful, simple designs that are inspired by real families everywhere. The company focuses on building intuitive devices that are easy to set up and reduce the stress of new mothers everywhere. The 2.4-inch video baby monitor is no exception and it is truly a beautiful piece of technology. With 242 reviews and an average of 4.5 stars, this camera is a great option for all parents. Reviewers were impressed with the clarity of the picture and while some complained of connectivity issues the overwhelming number of 5-star reviews is indicative of the quality of this monitor. One woman even commented that it was as good as the “name brand” Motorola monitor she had bought her older child at double the price! To Learn More about This Monitor, Click Here. Much like the NestCam, the KeeKoon is actually a security camera that many people choose to use as a video baby monitor. This item is a top seller on Amazon and has over 1,000 reviews, and it is easy to see why! This camera averages 3.8 stars out of 5 on Amazon. Most were impressed with how intuitive the app is to use and how easy it was to set up the camera (a sometimes tedious process). The camera connects to your home’s wifi network so you can easily see what is happening through the connected app. You can also have guests log on so your family and friends can see your baby from afar. While you have to open the app to see what is happening in your child’s room, it is a great solution for parents who want to repeatedly check on their child rather than let a baby monitor run at all times. To Learn More about the Camera, Click Here. Much like the other video baby monitors we have mentioned, the GBH is a fantastic option for parents who want to look over their child as they sleep. This monitor has an average of 4.1 stars among the 150 reviews featured on Amazon. Over 60% of these reviewers rated it at 5 stars and most bad reviews seemed to be the result of malfunctioning devices and connectivity issues. Overall, this seems to be a great product for parents who are looking for video monitors but who still want a more basic unit. To Learn More about the GBH Video Monitor, Click Here. The First Years has a proven 60-year track record of creating products for young children and new parents. The company knows that babies don’t come with an instruction manual, so their products reflect the creative solutions parents have to come up with every day. With an average of 3.8 stars, reviewers are generally happy with the simplicity of this device. Many felt that it served its purpose well, but did not go above and beyond other monitors. If you’re the kind of parent that is looking for something simple but reliable, this monitor is one to consider. To Learn More about the Clear and Crisp Monitor, Click Here. If you are searching for a baby monitor, don’t let the overwhelming process get to you. By knowing what you are looking for and paying attention to reviews, you’ll find the right device for your family.